It is a requirement of your Agreement, that the goods are protected against Theft and Accidental Damage. We can arrange Theft & Accidental Damage Cover for £0.78 per week. It is a requirement that products purchased on a credit agreement are insured. We can offer Theft and Accidental Damage Cover for £0.78 per week. 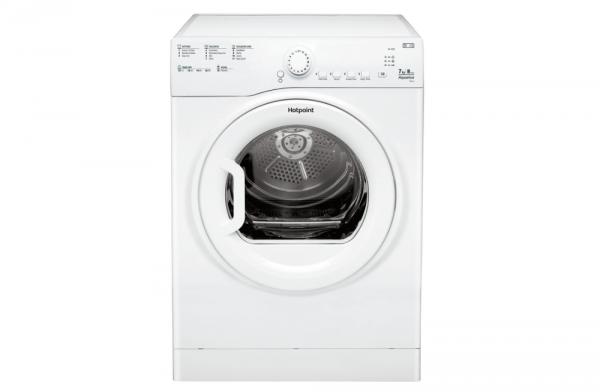 This Hotpoint 7KG Vented Tumble Dryer is perfect for saving energy whilst also saving money. The design has a white finish which will look perfect in your home. With an LED buttons and circular dial in the middle, you have complete control over the drying settings. The Hotpoint Dryer has an easy to pull handle and 7KG drum to make sure that drying your laundry is easy as possible.